BRICCO SUITES — David Duggan handles reservations for Bricco Suites, where a one-bedroom suite goes for about $249 a night, with discounts for longer stays. What do movie stars, cancer patients, and relocating biotech workers have in common? They all need somewhere to stay for extended periods while they work or get treatment in Boston. A growing number of visitors who don’t want to camp out at traditional hotels for months at a time are driving an expansion of the region’s short-term housing market. Several new extended-stay hotels have popped up around the city, while furnished apartments that can be rented for 30 days at a time are in high demand. These properties offer some of the comforts of home, such as kitchens, as well as the privacy of keyless entry and lower rates for longer stays. Nationwide, extended-stay hotel lodging grew at nearly four times the rate of all hotel room nights between 2007 and 2012, according to Smith Travel Research Inc., a hotel research company based in Tennessee. 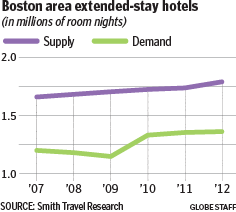 In Boston during that time, the extended-stay supply grew twice as fast as the city’s total­ inventory of available hotel rooms. An improving, evolving job market is among the factors driving demand for flexible housing arrangements. As companies rely more heavily on independent contractors for projects that may last only a few weeks or months, it creates the need for short-term rentals with room to cook, store belongings, and hang out on the couch. Increased hiring by biotechnology and pharmaceutical companies is adding to the demand as new employees look for permanent housing, said Patrick Flynn, chief executive of Northeast Suites of Stoneham. Flynn leases about 120 apartments in the Boston area, sets them up with furniture, linens, Keurig coffeemakers, Wi-Fi, TVs, and other amenities, and rents them by the month, with prices ranging from $3,900 to $12,000 a month. His clients have included a Saudi man who rented a three-bedroom penthouse near Massachusetts General Hospital, a newly hired Genzyme Corp. researcher, and actress Amy Adams, who stayed in Cambridge with her husband, baby, and nanny for two months while filming David O. Russell’s latest movie, about the Abscam FBI sting operation of the late 1970s. Flynn, who recently expanded to about 200 units around the country, said he expects revenue to double to more than $3 million this year. Demand for short-term housing is also rising as international medical patients flock here to receive treatment they can’t get at home. A recent report by the Tufts Center for the Study of Drug Development found the US Food and Drug Administration is approving cancer drugs faster than European regulatory agencies. “Europeans who don’t have access to the latest cutting-edge cancer care will likely come to a place like Boston,” said the study’s author, Joshua Cohen. Hotel brands such as Hilton and Marriott have increased the number of extended-stay properties, and independent owners are getting into the game. With few amenities beyond maid service, extended-stay properties are less expensive to operate than traditional hotels. Buildings are often accessed by security keypads, and guests can request towels and pay bills through interactive TVs, eliminating the need for onsite staff. 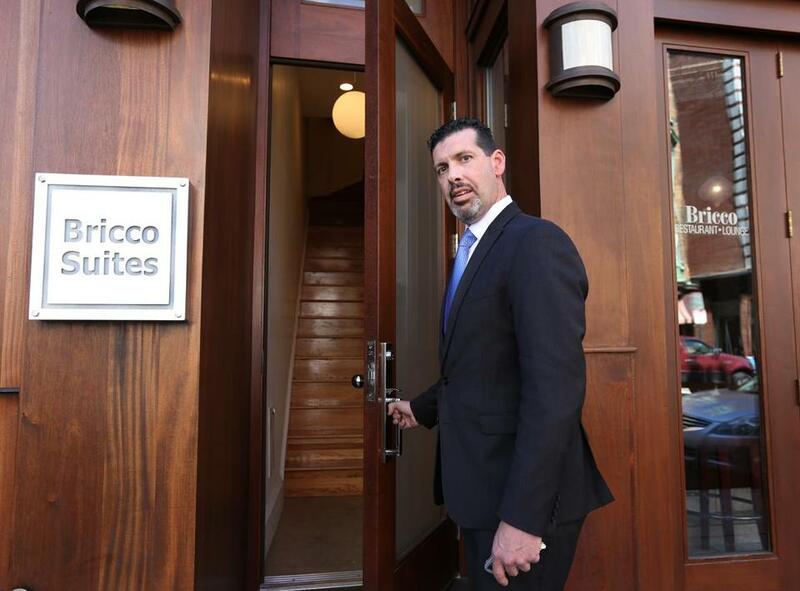 North End restaurateur Frank DePasquale recently converted the apartments above his restaurant Bricco into an extended-stay hotel with 15 suites. He put fireplaces and flat-screen TVs in almost every room, installed a steam room in one unit, and plans to add stovetops and espresso machines. A one-bedroom suite goes for about $249 a night, with discounts for longer stays. In the four months Bricco Suites has been open, it has housed tourists, families of hospital patients, and North End chefs stranded by a snowstorm. After seeing a growing interest in longer-term stays among his guests at the Chandler Inn Hotel in the South End,Cliff Long opened the 12-room Chandler StudiosBoston extended-stay facility last fall in a former rooming house across the street. The four-story building is accessed by a code and has a small fitness center on the ground floor and daily maid service. Each suite is outfitted with a kitchenette with two electric burners, a mini refrigerator, and a microwave; photos of the 1960s-era elevated Orange Line fill the walls. The studios range from $259 to $525 a night, with a 10 percent discount on stays of over a week and 20 percent off for two weeks or more. Peter Zupcofska, a lawyer with Boston firm Burns & Levinson, works mainly in New York but stayed at Chandler Studios for four months while working in Boston. He felt right at home in his first-floor studio, he said, whipping up meals of meatloaf and mac and cheese for guests. “It really does feel like you’re in your own apartment, as opposed to a hotel,” he said. Occupancy has been on the rise at the Inn@St. Botolph in the Back Bay, a 19th-century brownstone with 16 units that can be rented long term. A one-bedroom goes for about $250 a night, $1,800 a week, or $6,000 a month. The building has keyless entry, a lounge, gym, laundry facilities, and maid service.